The Flying Scotsman leaving Goathland. Credit: Paul Tymon/ Shutterstock. Four trains from four different generations are set for a historical meeting on Yorkshire’s East Coast main line. The Flying Scotsman will travel alongside two trains from Virgin Train’s revitalised fleet – a Class 43 HST and a Class 91 InterCity225 – as well as the rail operator’s brand new train, the Class 800 Virgin Azuma, on April 23. Beginning at 6am, the quartet will start at the Tollerton junction in North Yorkshire and travel 10 miles side by side on the four tracks south to York, in a celebration of the past, present and future. The procession is set to arrive in York at around 8am and is expected to end at around 9am. In anticipation a giant screen will broadcast footage of the train live from York station. 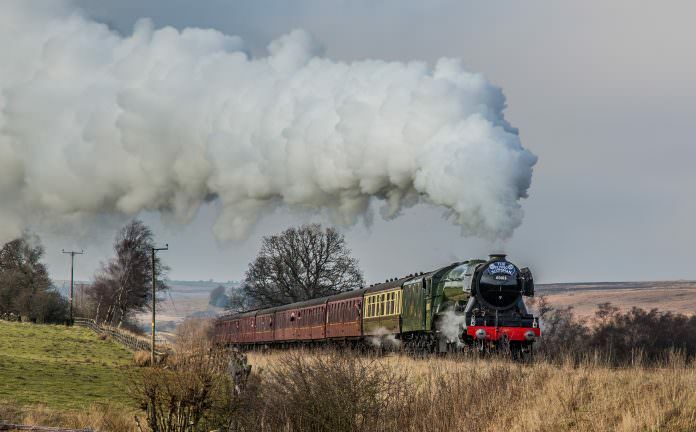 Paul Kirkman, director for the National Railway Museum in York, which owns Flying Scotsman, said: “The East Coast main line has long been famed for speed and style. “In the 19th century elegant locomotives were designed to haul trains on this route cementing its reputation as a railway racing stretch operated by thoroughbred engines. The Azuma fleet is being built by Hitachi in the North East and will come into service in 2018.